Blindly trust Redhot-roadrelics. We are backed with more than thirty years of experience. The website Redhot-Roadrelics is devoted to dealing with special signs, authentic signs and vintage collectibles buying. We also trade and sell displays, Americana, clocks, Primitives, Folk Art, vintage antique advertising signs, country store and many other signs available in the store. One thing is sure, you get 100% genuine and special signs rich in art and historical importance. You can purchase any signs with full confidence. Moreover, we offer a full money back guarantee if you feel like the signs you purchased is counterfeit or damaged. However, the shipping charges need to be borne by the customer. Our collection consists of old advertising signs, genuine. We include any sign in our collection after various inspections on numerous parameters. So, what you purchase first passes through the hands of Darryl Tilden(an eminent collector having an experience of more than 30 years). Therefore, no chances of any counterfeit signs in our collection. Various collectors are available in the market but limited to a single collection strategy. We are different from them, that’s why we have a huge collection. We have a great collection of vintage signs, authentic signs, and that insist me to quote a separate page for special signs. Signs of various fields like restaurants, drinks, automobiles, Oil & Gas, Automobiles, etc. are available with us. However, the drinks and the oil and gas signs are famous among collectors and buyers. Antique signs, vintage signs, old signs, advertising signs of various shapes, sizes, colour, and brands are available with us. As you know, our signs and advertising symbols are expensive. But the best part is, you get what you paid for. We deal in authentic signs, so don’t bother about any fake symbols. Authentic signs are expensive as compared to the fake ones. Need Special Signs: We are just a call away. Many enthusiasts call or mail me for the best quotations. However, owing to genuine signs, I offer a fixed price to all my special signs. As you all are aware of the fact that it takes years to collect the unique signs and special designs of various signs and symbols. Not to mention, I traveled all over the states to collect unique and special signs. If you are among the ones who find me on the web, believe me, you are the best customer as you already have evaluated me based on my feedbacks. A large portion of my visitors includes enthusiasts and collectors for their personal and business needs respectively. They are all aware of the signs and pay a respectful amount taking into account the collector cost and storing cost as well. Not to mention, to make sure these collector’s money is utilised in a great way, we make sure to provide them with the genuine and history-rich signs every time. 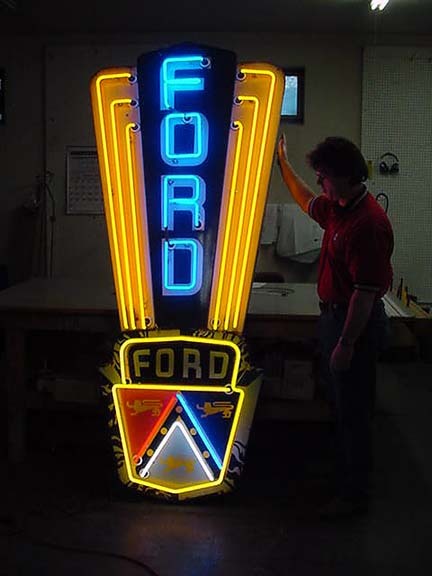 It’s our responsibility to offer you authentic vintage porcelain signs and numerous other signs. Moreover, if you feel like you are not satisfied with the signs, we are happy to refund you. But you need to pay for the shipping charges. We offer a 100% refund on the signs purchased from our store. However, in the last 30 years or more, we haven’t come across any cases. We are just a call away. Ring us at 612-723-1999 for any of your queries. Feel free to visit our other pages like auto and gas signs, metal signs, automobile signs, porcelain signs and much more.